eVenusArt will cater to all your needs whether you are an artist, architect, student, designer or anyone at all who uses art and design related products in their daily life! eVenusArt offers from basic to traditional stationeries and also latest trend art materials such as paintbrushes, canvas, paint mixtures etc. They provide a large collection of materials & supplies from many brands & labels, so you will definitely find what you want here. If you can’t, then you will just have to leave them a message and they will do their best to get it for you. So, what do they have besides the usual painting supplies? Don’t know where to get face & body paint in Malaysia? eVenusArt offers a wide variety of face & body paint colours because they know many of you Malaysians just love face painting especially during special occasions and celebrations. So, if you want to do a country flag face painting yourself, you can get the supplies for country flags like Australia, Brazil, England, France, Italy etc here. At eVenusArt, you can find a large selection of quality and hard to find architectural drafting supplies. If you are an architect or an engineer, then you will know that it is not easy to find a shop that cater to your profession needs. Well, now you can easily find a technical pen, mechanical pencil or pen for drafting, scale, set square, T-square and drafting templates that suits your taste. Batik is the art of decorating cloth using wax and dye, and has been practised for centuries in Malaysia. 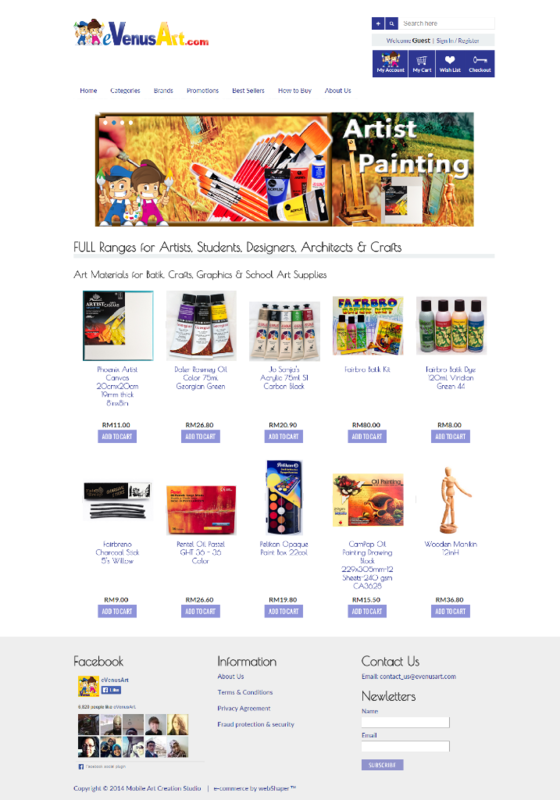 If you are a big fan of batik painting, you can get your batik kit here. eVenusArt offers batik kits from brands like Fairbro as well as Fairbreno. Love arts as much as we do? Stay connected with eVenusArt Facebook fan page for more creative art ideas! Are you a retailer? Wish to set up an eStore just like eVenusArt?